You'll want this one for Ireland, too! Plug Away: These little pluggy things let you connect American-style appliances into oddly shaped British and Irish sockets. Before You Go: Make sure your appliances have built-in 110/220-volt converters. If not, you'll need to buy a voltage converter (which we don't sell!) to use our plug adapters. Across the Channel: Continental Europe uses different plugs. 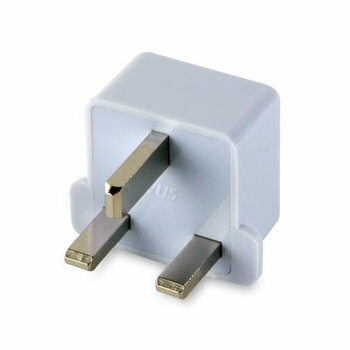 For travel there, get our Continental Europe Electrical Adapter. Dimensions: 1 ¾" x 1 ½" x 1 ¾"